Tens of thousands of people in New York City marched down fifth avenue on Sunday, celebrating Israel’s 70th anniversary, culminating the annual parade with a party in Times Square. New York Mayor Bill De Blasio, Governor Andrew Cuomo, Israel’s Consul General in New York Dani Dayan, and Israel’s Ambassador to the UN Danny Danon were among officials who attended the Celebrate Israel bash. Israeli officials in attendance included Culture Minister Miri Regev, Minister of Immigration and Absorption Sofa Landver, and Science and Technology Minister Ofir Akunis. The Israeli Consulate and Regev’s Ministry of Culture and Sport organized the celebration, where Israeli singer Shiri Maimon performed. 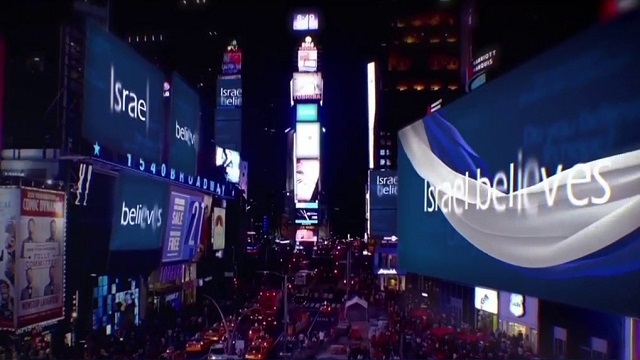 “Times Square is one of the premiere locations in the world; it is the liveliest, most innovative, and most appropriate place to highlight Israel’s breakthrough innovations in every sphere of life,” said Israel’s Culture Minister Miri Regev, who also attended the parade. Israel’s Minister of Immigration and Absorption Sofa Landver, and Science and Technology Minister Ofir Akunis also attended the march which has been an annual event since 1965. Weeks ahead of the event, the head of security at the New York consulate had advised against the participation of high-level officials over security concerns. “We forbid any participation or presence of any emissaries or employees at this event. This is a highly sensitive event without our ability to provide sufficient security. It should be noted that the New York police, including the highest echelons, stress that it is a very high-risk event, particularly at this time,” the consulate said. Despite the warnings, Consul Dayan vowed that he and Culture Minister Miri Regev would attend. “Relax. On 6/3 Minister Miri Regev and I, and all the diplomats from @IsraelinNewYork will march in the morning for Israel down Fifth Avenue and in the evening we will watch the closing presentation in Times Square. Everything is OK,” Dayan tweeted last month. The security concerns at this year’s event caused NY Police to increase the number of officers to 1,000, as well as adding 70 blocker vehicles to avoid car ramming attacks.